It’s January. You know what that means. Time to work off your Christmas carbs. Max out your gift cards. Buy journals that say inspirational things on the cover like ‘dream big’ or ‘she believed she could so she did.’ You know those things. Oh and one more thing: observe National Human Trafficking Awareness Month. For all of us here at Palate Coffee Brewery, human trafficking awareness month happens twelve months a year. But for the outside world, it’s a different story. We’d like to take this opportunity to show you how to raise awareness. And in true 21st-century style, it’s all about the social media. So get on your phones and start tweeting, retweeting, posting, liking, and hash-tagging. I’ve even written the words for you AND created social media graphics. January is #HumanTraffickingAwarenessMonth. Every year, between 100,000-300,000 children are trafficked in the United States. Let it be known: this is our fight. Raise awareness. Pay attention to your surroundings. Help end human trafficking. Does the person appear disconnected from family, friends, community organizations, or church? Is there a wide age gap between the person and someone they are with, however, they don’t interact as though they’re related? We know there’s already a lot of sad content on the media. But before change can happen, we need people to know that change is needed. So raise awareness, spread the word, and volunteer. 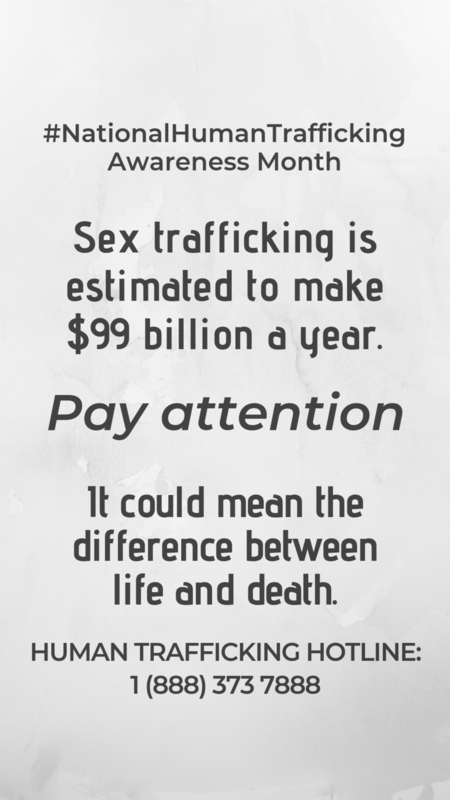 Together, we can fight to end human trafficking. Learn more about Palate’s parent anti-trafficking nonprofit, Love Missions, and what you can do to help fight human trafficking.